Are you believing some myths about Aboriginal people? Check this list to learn if they are true! Why is busting myths about Aboriginal people important? 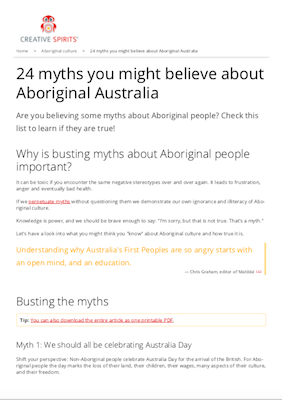 Get your free Aboriginal myth-busting PDF – just click the image! It can be toxic if you encounter the same negative stereotypes over and over again. It leads to frustration, anger and eventually bad health. If we perpetuate myths without questioning them we demonstrate our own ignorance and illiteracy of Aboriginal culture. Knowledge is power, and we should be brave enough to say: "I'm sorry, but that is not true. That's a myth." Let's have a look into what you might think you "know" about Aboriginal culture and how true it is. Tip: You can also download the entire article as one printable PDF. Shift your perspective: Non-Aboriginal people celebrate Australia Day for the arrival of the British. For Aboriginal people the day marks the loss of their land, their children, their wages, many aspects of their culture, and their freedom. In short, it celebrates a day of widespread loss, death and dispossession. How can you expect a race of people to celebrate that? Imagine if on April 25, Anzac Day, the Turkish community in Australia held a 'Defeated Australia Day', replete with a national holiday and people draping themselves in the Turkish flag, celebrating everything Turkish. Truth: We can find a better day to celebrate being Australian than the day of the invasion. The Wikipedia defines 'colonisation' as an act where a species "populates an area". It is a term derived from the Latin colere, "to inhabit, cultivate, frequent practice, tend, guard, respect". It defines an 'invasion' as "a military offensive" which "aggressively enter[s] territory controlled by another... entity, generally with the objective of either conquering, liberating or re-establishing control or authority over a territory". Looking at Australia's history we find at least 5 National Aboriginal wars (‘Frontier Wars’) starting shortly after the landing and lasting until the 1930s, spanning a total of 146 years. Add to that fierce resistance fighters such as Jandamarra, Windradyne or Yagan, the deliberate poisoning, shooting and massacring of Aboriginal families with the intention of wiping them out, and you have all the ingredients of a civil war and genocide. It's easy to assume that there is one Aboriginal culture in Australia. Truth is, there were more than 250 language groups with hundreds of dialects, and many had their own regional customs. Think of it: Aboriginal nations in the tropical, seasonally wet north must have had a different culture than those in the cold and dry south, saltwater people a different one than freshwater people. But many media fail to point out where an Aboriginal person comes from. They contribute to readers seeing "an Aboriginal woman" rather than "a Nyoongar woman" (i.e. a woman from a Western Australian Aboriginal nation). Similarly, many people think there is "an Aboriginal word" for something. In fact there once were probably more than 250 words for the same English word, given the language variety and many dialects. Truth: There are many different Aboriginal cultures, customs and languages in Australia. Some Aboriginal people in some jurisdictions of Australia do have some land rights. But those rights are always under threat, and they almost always give way to non-Aboriginal economic or political interests (e.g. development, mining) if there is a conflict. Initially Aboriginal people owned 100% of Australia. In New South Wales they now own less than 0.01%. Is this a fair compensation for what they lost? If you look at maps showing Aboriginal land it is almost always in areas that non-Aboriginal people have no interest in. Also, land rights legislation is under constant attack from Australian governments who try to whittle it down. Aboriginal people have a very special connection to the land. Destroying that connection means destroying the people. Truth: Land rights have failed to deliver, and never will. This is one of the great myths of Australian history. It is still promoted by people like journalist Andrew Bolt or former Prime Minster John Howard. The children of the Stolen Generations will be forever traumatised by what happened to them. There was little, if any, 'good' that happened to them. Denied the same basic rights as everyone else, the majority was physically, emotionally and sexually abused. And governments continue to take away Aboriginal children, more than ever, still pretending they are 'neglected' and need to be cared for. They are on track to create a new Stolen Generation. Imagine yourself into a family that struggles to make ends meet but loves you no less than anyone else. If you were taken away, would it be for your own 'good'? Truth: Aboriginal children were enslaved to be assimilated. There is a difference between the representative of a state or nation apologising and a nation acknowledging injustice. When PM Kevin Rudd said sorry to the Stolen Generations it was a necessary symbolic act because for too long the government had refused to recognise this history. But we still need to acknowledge this history, not bury it. Realise that it is still going on today. Every new class at school needs to learn about it to better understand Aboriginal people. If you think we have said 'sorry' enough, look at Anzac celebrations: Aren't we continuously saying 'thanks' to the war veterans? Shouldn't we stop that then as well? Truth: Aboriginal people are not asking you to say 'sorry', they are asking you to respect and acknowledge their true history. Did you know Australia has a history of slavery? Most don't. While America abolished slavery hundreds of years ago, it was still well entrenched in Australia well into the 1960s. Aboriginal people were forced on to pearling luggers, South Sea islanders kidnapped ("blackbirded") to sugar cane farming. In a bi-partisan report handed down in Federal Parliament in 2008, both major parties acknowledged the practice of stealing Aboriginal peoples' wages. Young black men and women were forced to work, and then had their wages and savings controlled by government, only for that money to disappear into state coffers. In Queensland, for example, government used Aboriginal wages and savings to build infrastructure like hospitals, which Aboriginal people were then prevented from accessing. Truth: Aboriginal people contributed significantly to building Australia, mostly without compensation. 'White Australia Policy' wasn't formally abolished until 1976. Aboriginal government workers in Queensland were paid less than non-Aboriginal workers for the same duties until 1986. Australia's jailing rate of Aboriginal people in 1991, at the height of the Royal Commission Into Aboriginal Deaths In Custody, was one of the worst on earth. Today, it is much, much worse. There is no state or territory in Australia that jails black males at a rate less than Apartheid South Africa. Governments are shutting down and bulldozing Aboriginal communities. Taking away children. Compulsorily acquiring Aboriginal land to mine its resources. Truth: Much trauma happened in the past, but bad things are still happening today. Former prime minister John Howard used this argument to stubbornly refuse to apologise to the Stolen Generations. Many Germans used it to refuse acknowledge the atrocities of the Third Reich. There might not be a personal responsibility, but there is a moral one. You wouldn't be where you are today without Aboriginal people working as slaves, governments spending Aboriginal money and exploiting Aboriginal land. Just think resources. You might not have 'done it', but you sure have benefitted from it. If you are the beneficiary of something terrible done to other people, do you owe those people, at the very least, an acknowledgement of the truth of what occurred? Truth: We have a moral responsibility to acknowledge and not let these things happen again. Imagine this: Your neighbour 'acquires' your backyard to make it part of his own. You call police. You and your neighbour talk without resolving the conflict. After a while, police suggest to 'move on', leaving you without a backyard. In 2012, while the Aboriginal Tent Embassy was celebrating its 40th anniversary, then-opposition leader Tony Abbott suggested that things had improved, and it was 'time to move on'. He forgot that everything the Tent Embassy stood for had not yet been delivered: a treaty, sovereignty and national land rights. So why should Embassy activists move on? Why should Aboriginal people more generally move on? Why should you move on without a backyard? Aboriginal Australians have one of the worst life expectancies on earth; suffer illnesses eradicated elsewhere, such as trachoma; are incarcerated at atrocious rates - If this was you, would you agree to 'move on'? Truth: It is time to roll up the sleeves and do something. Figures of the Australian Bureau of Statistics show that almost 80% of Aboriginal people live in major cities or regional Australia , yet most representations of "Aboriginal people" incorporate some form of remoteness or outback. Such images refer to a minority - less than 14% of Aboriginal people live in very remote areas. It is much more likely that you meet an Aboriginal person while you go shopping than when visiting places in remote Australia. You just need to see them. Truth: Most Aboriginal people live in cities or rural areas. Before invasion Aboriginal people had dark skin that protected them from the sun. Children of mixed descent were first the result of sexual abuse by white men on stations, missions and in foster homes. Later mixed romantic relationships increased the numbers of Aboriginal people with fair skin. This myth stipulates that you need to have dark skin to identify as Aboriginal. But it is up to the individual to make that decision, not you. If someone has Aboriginal grandparents and strongly identifies with this side of their culture they call themselves "Aboriginal". And we should accept that. Truth: Aboriginal people, like all of mankind, come in all different shades. Many people accept that Aboriginal people are good at arts and sport. They know dot paintings and AFL or NRL players. But there is more. Aboriginal people are also successful in science, law and medicine, among other areas. For example, Dr John Moriarty is a successful businessman and chairman of the Jumbana Group. Bob Bellear was the first Aboriginal Australian judge and Dr Kelvin Kong is an accomplished surgeon. Neville Bonner became the first Aboriginal parliamentarian. Samantha Harris is a successful fashion model. Linda Jean Burney is an Australian politician and was a member of the NSW Legislative Assembly. Aboriginal feminist Celeste Liddle is also the National Indigenous Organiser for the National Tertiary Education Union. Aileen Moreton-Robinson is an academic, feminist, author and activist for Aboriginal rights. There are hundreds of successful small Aboriginal businesses nobody knows about. Truth: Aboriginal people can be successful in all areas in life, just like you and me. The myth of Aboriginal extinction in Tasmania is grounded in the story of Truganini, a woman from Bruny Island, who died in 1876 after being the sole returnee from the Flinders Island mission where Tasmanian Aboriginals were sent for resettlement. Assuming Tasmanian Aboriginal people died out because their last person passed away, however, ignores their descendants. Aboriginal Tasmanians of mixed descent are in a constant struggle to remind the larger population of their existence, history and culture. While traditions and languages were severely affected by the loss of lives, Tasmanian Aboriginal people have adapted and continue to practice cultural traditions. Truth: Tasmanian Aboriginal people are very much alive. It is true that there used to be physical punishment in traditional law, such as spearing, when people broke the law. But physical or sexual violence, against women or children, never formed part of traditional cultural practices. In fact, more non-Aboriginal children are physically or sexually abused than Aboriginal children. Violence is learnt and abusers have often been victims of abuse themselves. For them it is often a cry for help or the only way they know to reduce their pain. The 'Little Children Are Sacred' report on abuse in the Northern Territory, released in June 2007, concludes: "Sexual abuse of children is not restricted to those of Aboriginal descent, nor committed only by those of Aboriginal descent. The phenomenon knows no racial, age or gender borders. It is a national and international problem." Truth: Trauma leads to violence. It is a worldwide problem. This myth is the result of a massive media campaign after the 1992 Mabo decision. In 1992, when the High Court handed down its Mabo decision, for the first time Australian law recognised Aboriginal people’s connection with, and rights over, land. This is known legally as native title. The decision overturned the concept of an empty continent belonging to no-one ('terra nullius'). Following the Mabo verdict, opponents and media spread a lot of misinformation, declaring that ‘Australians were going to lose their backyards’. Sadly, despite dozens of Native Title decisions proving otherwise, this myth still lingers today. Native title cannot affect existing property rights. Native title claimants can only assert their title over publicly owned land, called Crown land. Any house (including its backyard) is considered private property and therefore extinguishes native title. Truth: Your backyard is safe. Native title only affects public land. Across all age groups in the 'low risk' group fewer Aboriginal people drink alcohol than non-Aboriginal people. On average, 55% of the non-Indigenous people drink at low risk while only 36% Aboriginal people do. In the 'risky' group proportions are about equal between Aboriginal and non-Aboriginal people. This is also true for the 'high risk' group, except for people between 35 to 54 years of age. Here, almost twice as many Aboriginal people drink alcohol. 29% of Aboriginal Australians did not drink alcohol in the previous 12 months, almost double the rate of non-Aboriginal Australians. In fact, Aboriginal people are 1.4 times more likely to abstain from alcohol than non-Aboriginal people. More than 43% of 16- to 17-year-old Australians drink to "get drunk". 36% of adults in New South Wales do the same. And 20% of them admit they can’t stop drinking once they started. No wonder that 80% of Australians believe the nation has a drinking problem. Truth: Australia as a nation has a drinking problem. Fewer Aboriginal than non-Aboriginal people drink alcohol. This is another persistent myth. About 33% of Australians aged 25 to 44 believe this is true, except in Western Australia where more than 60% believe that . The Aboriginal unemployment rate is 3 times the national average. In South Australia, for example, the 2006 Population Census recorded an unemployment rate of 20.3% for Aboriginal people, compared to 7.5% for the state’s non-Aboriginal population. These rates are higher not because Aboriginal people don't want to work or learn, but because they encounter difficulties and discrimination. Other factors are education, training and skill levels, poorer health, limited market opportunities, and lower levels of job retention. More and more Aboriginal youth want to go to university. Between 2001 and 2011 the number of Aboriginal students in higher education grew by 20%. Truth: Aboriginal people want to learn and work but are hampered by discrimination. It is easy to believe this myth especially with papers reporting millions and billions of dollars spent on Aboriginal politics. The question is: Who received this money? In 2011 the Australian Productivity Commission (the government’s independent research and advisory body) found the returns on this investment “dismally poor”, the Finance Department “disappointing at best and appalling at worst”. "Around a third of Government funding for Indigenous programs doesn’t even make it past the front doors of office buildings," says the Chair of the Indigenous Advisory Council, Warren Mundine. The government’s approach is “seriously flawed” because funds are allocated to too many different agencies with no single person or organisation responsible for improving outcomes. NSW Aboriginal Affairs Minister, Victor Dominello, recounts a visit to a small town that he wouldn’t identify. He met about 20 of the town’s service providers. ‘‘In domestic violence, there were three or four of them doing exactly the same thing, but getting pools of money from different governments and different agencies within governments. “And guess what? They all had a front office; they were all paying rent. There was all this inefficiency. This was for a population of 2,500." Truth: A lot of money is spent in Aboriginal affairs, but very little trickles through to where it is needed. But Aboriginal people are subject to the same social security laws and entitled to no more (and no less) government sponsorship than any other Australian. There has never been a government program that distributed free houses or cars, and Aboriginal students have to pay for university like everyone else. It is incorrect to say that Aboriginal people receive undeserved special treatment. Tailored solutions are necessary to overcome the unique challenges that confront Aboriginal peoples. Truth: The government has no freebies for anyone. Programmes need to be tailored to people – especially those facing hardship. Myth 21: PM Kevin Rudd apologised "for the grief, mistreatment and suffering since colonisation"
This is a fairly recent myth propagated by journalists who didn't do their homework and subsequently got their facts wrong. Rudd didn't apologise to all Aboriginal Australians. He only apologised to the Stolen Generations, a minority who had suffered from government policies which were used end of the 19th century to the 1970s—and not "since European settlers landed" in Australia. Truth: Prime Minister Kevin Rudd apologised to a minority of Aboriginal Australians. This myth assumes that Aboriginal children are only aspiring to lower-paying jobs in trade, hospitality or sales. Thus we need to encourage them to 'aspire high' and see themselves work in top-paying jobs. So rather than trying to make Aboriginal children's visions match that of their non-Aboriginal peers, we need to nurture the strong aspirations they already have in primary school. Truth: Aboriginal children are as aspirational as their non-Aboriginal peers. Even anthropologists, linguists and other researchers get this wrong. According to the myth, Aboriginal people only had number words up to 3 or 4, used the word 'hand' for 5, or compounded larger numbers with words for smaller ones. The Torres Strait Islanders, for example, had words for one hundred ('mauru') and one thousand ('kai gasa'). Truth: Aboriginal people's mathematical skills go far beyond counting to five. The myth states that Aboriginal people were covered by a flora and fauna act, which did not classify them as human beings, and that this only changed when the constitution was amended following the 1967 referendum. Fact is, Aboriginal people in Australia have never been covered by a flora and fauna act, either under federal or state law. The myth most likely emerged because government departments and historical reports brought together the words "flora", "fauna" and "Aboriginal". If you look at all the Australian coins you might get the same impression. "The myth that the constitution included a reference to Aboriginal people under the 'flora and fauna' section is entirely erroneous," says Professor Helen Irving, an expert on Australia's constitution. Truth: Aboriginal people were never classified as 'flora' or 'fauna'. Just enter your name and email and I'll send the link to your FREE download instantly! You will join the Smart Owl community.